Huipils are one of the most amazing works of functional art that I have ever laid eyes upon. The embroidery work is divine, the color combinations are bold and the traditio n of wearing them runs deep. Sadly, this tradition of wearing huipils is slowly disappearing. Huipils are common sighting thruout Latin America. My favorite regional designs come from the Isthmus of Tehuantepec, the design is often referred to as Tehuana. My future mother-in-law can be found wearing this pattern work daily. 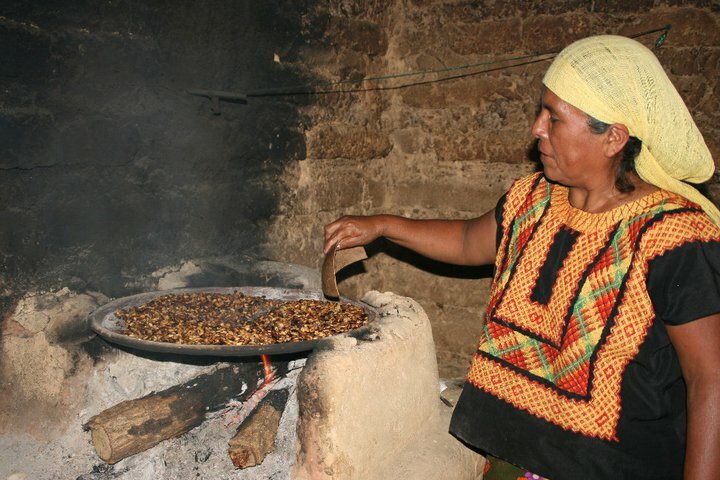 She is a descendant of the Mixe indigenous culture and still speaks in one of the traditional dialects. Here -you can see how Huipils are used as an all purpose outfit. The people in this region, by "Western standards" are considered "poor farmers." I beg to differ. Look at t heir daily wear! Huipils are expensive-even at a local level. I often preach to everyone at the farm that they are amongst the wealthiest in the world. 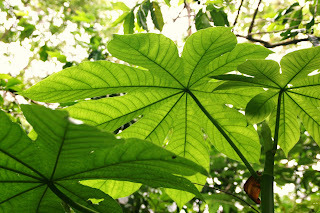 They own thousands of fertile hectares along with land water rights. They eat organic food daily, & range free meats weekly. No on e in the family owes a single penny to the banks. If you compare a balance sheet of one of these "poor farmers" to a typical American family whose sheet is usually "in the red" you also might start looking at them differently. I am proud of my fiance's family roots. I never visit them with pity. I visit with a different perception of wealth. 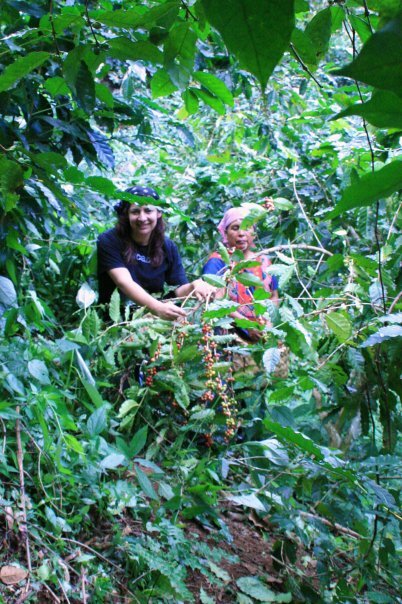 I love going to the coffee farm! It's rich in food, tradition and life! Where was I...oh yeah..HUIPILS! Although I own many huipils, I find myself only wearing them for special occasions because I value the pieces I have. Most have been gifted to me as hand me downs (imagine that one)! Huipils are very expensive to own. 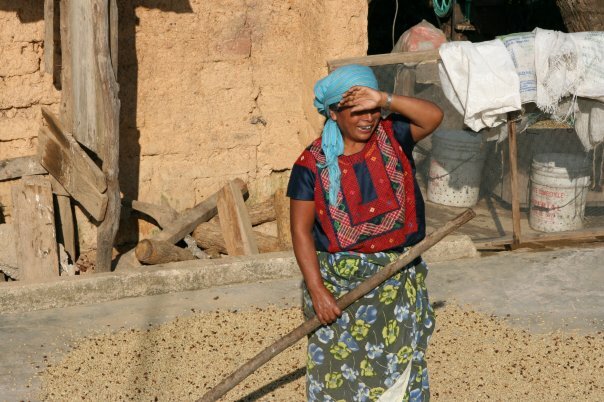 I could never imagine wearing my treasures while cutting coffee or planting crops. Hanging from a coffee branch in my treasured best isn't my style. My farm clothes are from Goodwill!! My mother-in-law wears a different huipil EVERY day. In my opinion, that's wealth! What do you think? Interesting isn't it? I FINALLY finished a painting yesterday. "Huipil Girl" You can see how the embroidery work combined with a photograph that I took at the farm brought this piece to fruition.I really loved the rich colors that I was able to draw from the embroidered textile. Looking forward to creating more huipil inspired pieces! My favorite art space in Oaxaca is La Telarana. The lighting is spot on. The space is well designed and the creations they display are always well curated. This "Jaguar" piece was created from palms, reeds etc and it took the artist over a year to create! A stunning piece of organic soft sculpture! This Giant "Fish" sculpture was created by a team of artists. There was no limit on what their imaginations brought to the piece. It's brilliant, funny, and ironic all at once. I enjoyed the hanging sock and cockroach body attached. Oaxacan's have a sarcastic sense of humor. It shows in this piece. Speaking of a sense of humor. This stuffed piece with a chair next to it gives everyone the freedom to sit next to the piece and smile. The first time I went to this space was for the Oaxacan Film Festival to see a series of children's short films with my daughter. I always look forward to seeing what they piece together. La Telarana is an inviting and warm space filled with spectacular cultural happenings. 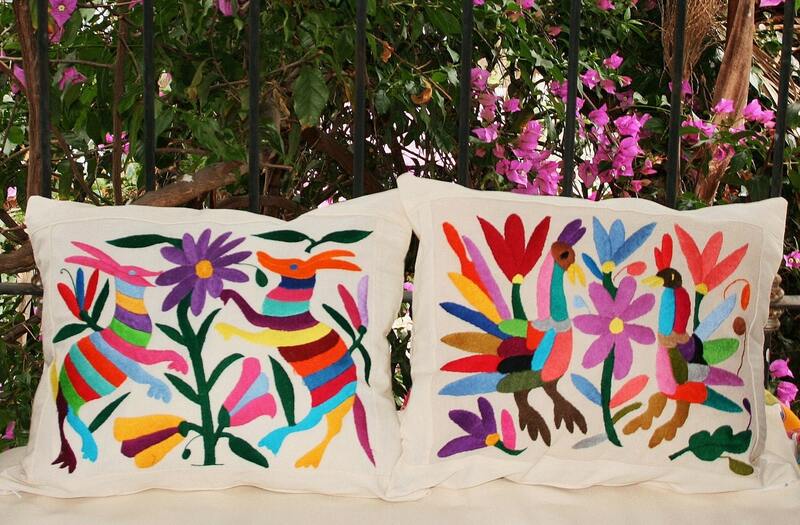 I love Otomi embroidery. The designwork is simple yet sophisticated and in general-Mucho Eye Candy. 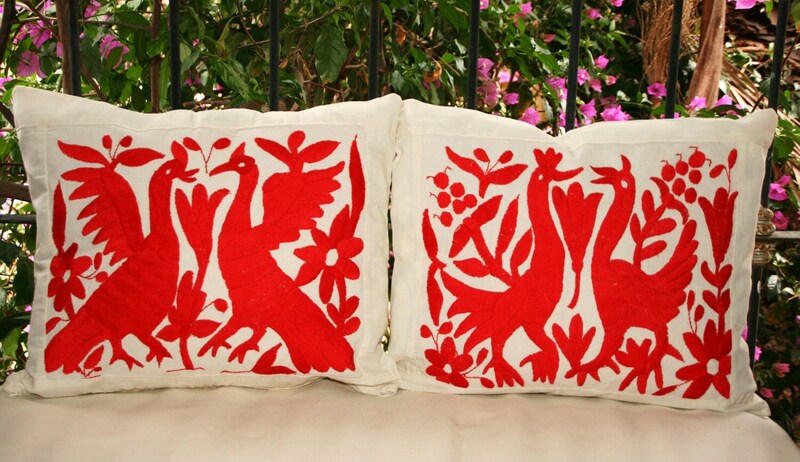 I have been collecting Otomi orignal works of art for over a decade. I have framed them, turned them into pillows and have used them as banners. The possibilities are endless. Even my daughter is lugging around a smaller piece for a patch one day when her jeans tear-she's looking forward to that day! I recently moved into an unfurnished apartment here in Oaxaca and have been salivating at the possibilites that the empty slate has given me. As much as I love the intricate Tehuantepec embroideries of the Isthms region, the primitive style of the Otomi seems to keep grabbing my attention and HOLDING it. Key word. Art, beautiful things, original creations always grab my attention. WHAT gets me to open up my tight budget to spend? 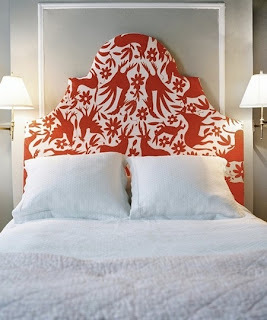 Otomi Creations!I recently saw this Apartment Therapy piece and it got my creative juices flowing! Needless to say. I am going full blown Otomi! Currently I have been working with a seamstress to get pillows made for wholesale and retail and it has been super fun to see the pieces come to fruition. The artists that I am working with are creating special sizes so that I can get square shams made in the future. Like I said earlier, with these beauties-the possibilities are endless. Above are a couple of photos of creations that I thought were worth the picking. I had them turned into pillow sham sets and they are now available on Etsy. I am very very picky. I look for tight threading. I look for no "pencil markings", no stains etc...oh and of course gorgeous imagery. For every 100 that I see I pick about 5. With some of my pieces I am thinking of making a "headboard" type backing for our make shift guest bed/sofa. Since more "modern" furniture here in Mexico is so expensive and "poorly" made, we are having to create our own sofa set up. I am having a duvet cover made for the twin matresses and am placing the matresses on a simple platform. Slowly it is coming together. I'll post photos when the project is completed. Many steps away! 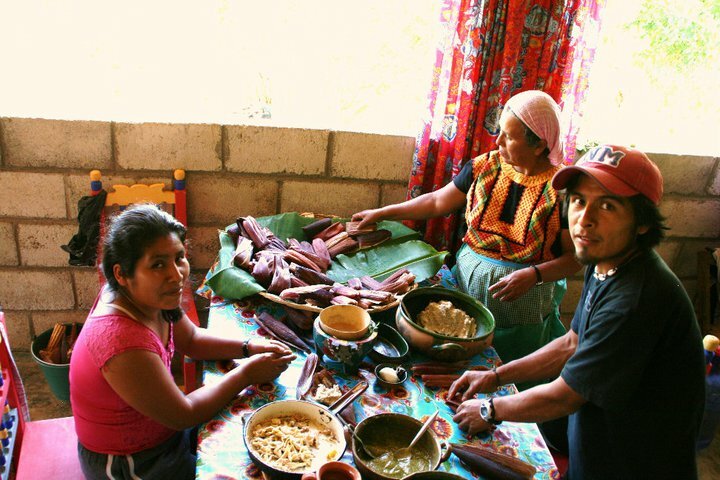 If you would like to know more about the Otomi, click here!